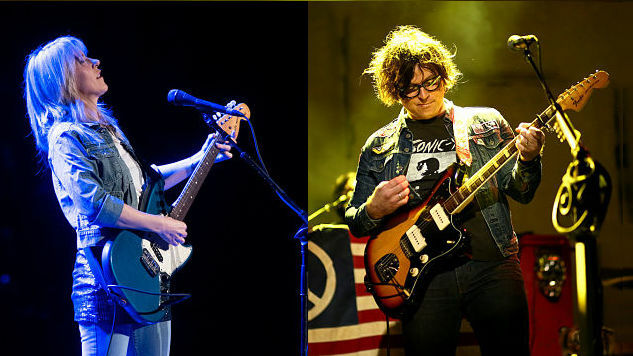 While Ryan Adams may be gearing up for the release of his own new album, Prisoner, it hasn’t stopped him from bringing in artists he loves to his own Pax-Am studio/record label to work up some musical magic. Last year he worked on his second album with Jenny Lewis, the follow-up to 2014’s The Voyager, and yesterday Adams tweeted that he was beginning work recording a double (!) album for Liz Phair. This will be Phair’s first album since her 2010 independent release, Funstyle, and, assuming it will be put out via Adams’ Pax-Am label, her first proper label release since 2005’s Somebody’s Miracle. In a tweet this morning, Adams announced that they had worked through five songs in the first day of recording and stated that the music harkened “back to those sounds & that rawness I first heard on Exile” while calling Phair “an American treasure.” Pictures from Adams’ Twitter and Instagram accounts also indicate that producer/bass player Don Was joined them in the studio. Phair’s Exile In Guyville is an undeniable classic and hearing her return to that sound after almost 25 years, with Ryan Adams at the helm, has us excited. See Adams document the sessions below, and listen to a 2006 recording of Ryan Adams & the Cardinals live in New York via the Paste Cloud. Adams’ album Prisoner is due out Feb. 17, while Phair’s album is currently without a release date. Unreal. 5 songs in 1 day. All analog.